New Smyrna Beach Condo Rental: OCEANWALK #5-306 'Beachbreakaway' NEW SMYRNA BEACH FLORIDA 5300 S ATLANTIC AVE! OCEANWALK #5-306 'Beachbreakaway' NEW SMYRNA BEACH FLORIDA 5300 S ATLANTIC AVE! Comfortable Seating. Bright and spacious. Spacious open floor, well maintained, very clean and comfortable. Comfortable, open floor dining area. Spacious open kitchen. Well equipped, very clean and beachy. Spacious Master Suite, walk in shower. Very clean and bright. Comfortable seating. 194.8 sq ft screened in private porch. 194.8 sq ft screened in private porch. Comfortable variety of seating. 194.8 sq ft screened in private porch. Facing west for gorgeous sunset views. No other condominiums in site. Large separate laundry area off kitchen. 1 Twin bed, 1 Full size bed in second bedroom. Spacious, clean and comfortable. Second bedroom has small wall mounted tv. Second bedroom is steps from second bathroom. Shower and tub. Large entry hall. Clean, comfortable, spacious, beachy. Welcoming large entry. Closet to left has guest beach equipment. Welcoming entryway. Convenient to stairway and elevator. Oceanwalk #5-306. 5300 S Atlantic Ave, New Smyrna Beach FL 32169. Located near end of building, convenient entry. Clean newly restored in 2018 building #5. #5-306 is steps away from elevator. #5-306 convenient location for easy in and out. Oceanwalk #5-306 located in building 5 on 3rd floor. Build newly renovated 2018. As a guest of Oceanwalk 5-306 you will have a garage door opener free of charge. Plenty outside parking spots. No trailers allowed. Enjoy a very well maintained Oceanwalk community. View of clubhouse #1. No glass in pool area, use 5-306 plastic cups/wine cups. Clubhouse #1 and pool view. Plenty of seating. View of Clubhouse pool #1. Sun, shade, picnic, grills. Clubhouse pools are open 7:30 am -10:00 pm. View of Pool at clubhouse #1. Clubhouse #1 is closest to unit 5-306 and boasts many amenities. Lighted courts until 10:00 pm. 10 person theater room located upstairs clubhouse #2. Clubhouse area has showers and restrooms. Kayak launch area on site. Kayak launch within Oceanwalk complex. Kayak rentals available at local shops. #5-306 location. Building #5. Closest to Clubhouse #1. Very private setting. Oceanwalks gated community is well maintained. Push button crosswalk to Oceanwalk direct beach access. Oceanwalk beach rinsing station along walkway. Boarded walkway/steps to beach. No hotels make for less crowds in season. "No Drive" section New Smyrna Beach. Lifeguard's were on duty summer season 2018. 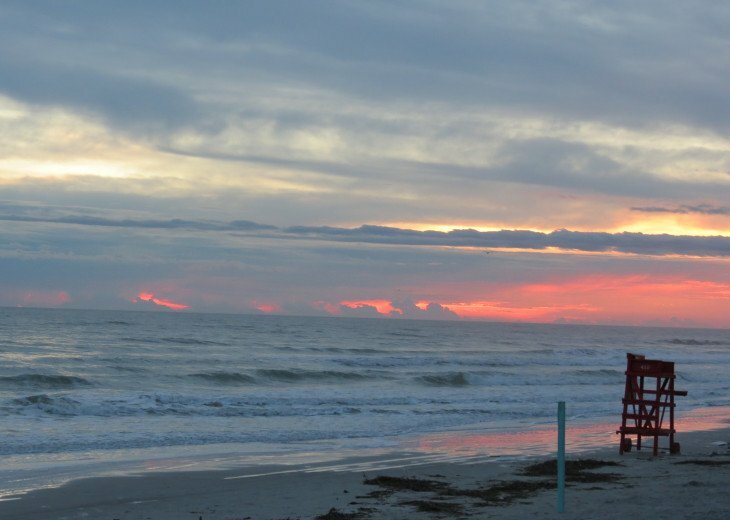 Enjoy the beauty of the "No Drive" New Smyrna Beach. Example layout of Unit Oceanwalk #5-306. 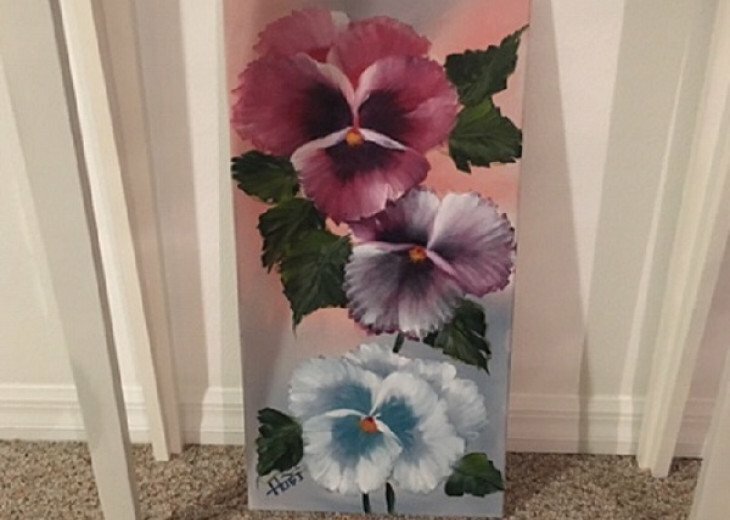 A beautiful painting; A gift to Oceanwalk #5-306 from January 2019 guest. Living Area: 1584 sq. ft. Need early check-in or Late check-out? Inquire when asking for a quote: With direct owner contact here first, we will be able to help you with any questions. Guests of #5-306 at Oceanwalk can unwind and relax while enjoying 2 clubhouses which feature swimming pools, hot tubs, saunas, exercise rooms, gas grills, bocce and tennis courts, shuffleboard. The community has a deeded private beach access with a push button pedestrian walkway. No Drive Beach area with rinsing station. Guests of Unit #5-306 will enjoy a comfortable stay in an open floor plan, separate walk-in laundry, equipped kitchen, king master suite with cable TV, 2 full baths, twin and a full bed in guest room. This is a WIFI Unit. Linens are provided at no extra charge. All beds are made and ready upon arrival. Entry hall closet has beach equipment and beach towels to use during your stay. Relax on the large screened-in comfortably furnished porch. Enjoy the peace, serenity, and privacy of this 3rd floor view facing westward, overlooking the 'Indian River Estuary'. There is no view of the river itself since it is densely covered by natural growth of palm trees and other greenery. Gorgeous picture perfect evening sunsets. Unit #5-306 is steps to the covered staircase and elevator and building elevator. Feel free to contact us with any questions and quotes. 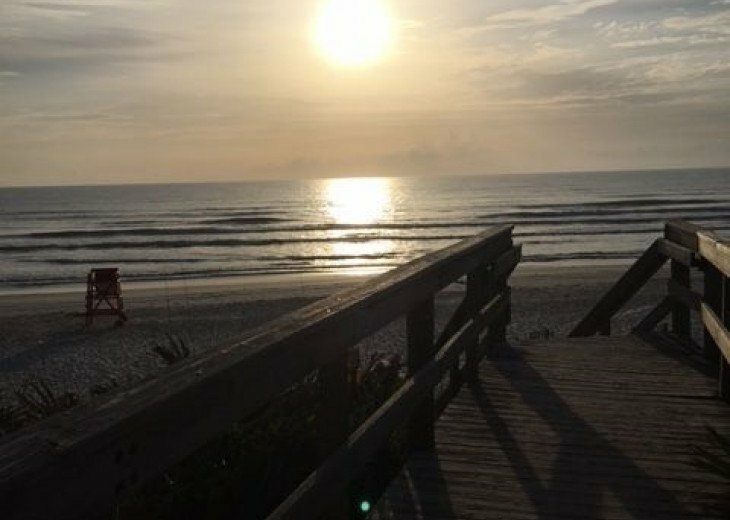 Traveling to Oceanwalk Condominiums at 5300 S Atlantic Ave, New Smyrna Beach Florida 32169 for 13 years and searching for the perfect condominium brought us to Unit #5-306. #1. Pay in full 90 days prior to check in to be able to pick up and drop off unit keys at office located at Clubhouse #2. #2. On site office hours 9:00 am - 5:00 pm 5 days. #3. Main office is located at 3500 S Atlantic, office hours 8:30 a.m. to 6:00 p.m. Monday - Saturday. Sunday 9:00 a.m - 5:00 p.m.
#4. Borrow for free the numerous beach items, boccie set, shuffleboard set, tennis rackets and ball, 2 fishing poles, sand toys, pack n play, DVD & Blu Ray, surfboard, camping chairs..... 2 adult bicycles, 2 young people bicycles. Inquire at office ahead of time for availability. Kayaking the Indian River, Fishing, No drive Beach, Bicycling, Tennis, Bocce, Shuffleboard, Surfing. No hotels in view makes for an uncrowded area. * A non refundable $50.00 Damage Waiver Fee on all reservations is in lieu of a Damage Deposit, tenants and guests are not however released from liability. A credit card is needed and kept on file for damages: Visa, MasterCard or Discover. * Advanced reservations may require a $500.00 deposit which is applied towards the reservation and used to secure the reservation. * CSA Travel Insurance is optional (6.5% of the base rental rate). * As the owner of Oceanwalk 5-306 we will work with guests to negotiate a base rate, explain the fees, taxes, area interests, dining ideas, travel to destination and any other questions. We can help with early check in and late check out possibilities. 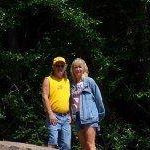 About the owner: Pittsburgh natives and avid Steeler fans! We have a mini farm and care for 3 aging Quarter Horses. 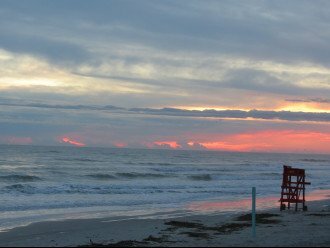 When we can get away from the farm we love to travel to New Smyrna Beach Florida. One of our favorite things to say is that we were "Professional Renters". Guaranteed cleanliness and comfort tops our must have list. We follow up with the professional cleaning company and get updates for any needed repairs. Following Florida state law for required deep cleanings 1-2 times per year. Why this property? After renting in the New Smyrna Beach area for 13 years and staying in a variety of houses/condos, Oceanwalk Condominiums became our #1 choice. We have stayed in every style 2 and 3 bedroom at Oceanwalk. It has taken 5 years to find the one. Enjoy relaxing on the private well furnished porch, beach theme and a well equipped kitchen with plenty of silverware, cooking items, and utensils. Not really caring if all the utensils match just wanting plenty to chooses from :) Did not want granite countertops, dark cabinets and cold tile floors throughout. 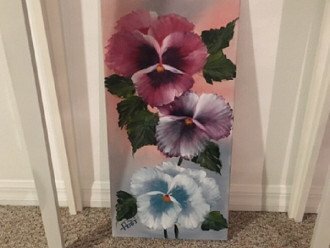 We wanted a beach feel and a vacation from what's typical at "home". Have we mentioned Community amenities galore! You can be as relaxed as you want or active as you want. Hi we really enjoyed our first stay at Ocean Walk and our unit was perfect and fully supplied we didn't need a thing. Will love to stay in this unit again. Wonderful condo! Thanks for sharing with us. Can't wait to come back. Beautiful place. Love it here. You have thought of everything. Can't wait to come back. Very clean and inviting, exactly the beach getaway we were looking for! The amenities are also wonderful, we relaxed and grilled by the pool, played shuffleboard and tennis without having to deal with any crowd during our stay. We also drove over to Disney for a day and had a great time. Will be returning to this condo in the future! The rooms were so clean and tastefully decorated. We ate out every night with all the great restaurants (many in walking/biking distance) that were suggested but if you wanted to stay in the kitchen has everything for you to cook/eat with. Relaxing in the complex by the pool or walking on the beach, which is right there just made the week fly by. So many things I had to see and do while Gary went to the on-site gym. It was very easy to drive (on my own) to see St Augustine, the dunes, and we even made our way for a ride along at the Daytona speedway Petty experience. I don’t ride anything at amusement parks but going around that track at 150 mph or more I would do it again in a heartbeat. Can’t wait to go back and maybe talking my brothers and sisters to venture too. You can be as busy as you want or as relaxed, Thank you for a great time. OCEANWALK #5-306 has Wifi. Enjoy a comfortable stay in an open floor plan featuring an open kitchen, separate walk-in laundry, king master suite, 2 full baths with bath towels, twin and double beds in guest room. All beds are made. Beach equipment and beach towels to use during your stay. Large 15x9 screened-in porch to view the gorgeous sunset! Yes, WIFI is available in Condo #5-306 and it is also available in each of the 2 Clubhouses. How far is the Condo #5-306 from the Elevator? Condo #5-306 is approximately 10 steps away from the elevator as well as the staircase. *Hint: take the elevator to garage parking area. Take the stairs to exit building for outside parking. Is the beach within walking distance? The beach access is approximately 100 yards. Can the cleaning fee be waived? No, it is across the street from the ocean. Approximately 100 yard walk to the semi-private beach access. How many people guests are allowed? Up to a family of 4 allowed. What is the minimum age allowed to lease? Minimum age of 25 years old allowed to secure lease, family units only. Yes, CSA Travel Protection is offered at 6.5% of the base rate. Visa, Mastercard, Discover, Money Orders. Will you consider 5 guests? If you are a family of 5 please forward the ages of your guests for consideration. Are trailers allowed in the parking areas? No. 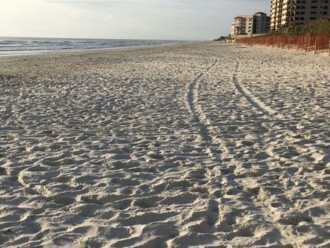 No travel trailers, boat trailers or trailers of any kind are permitted to be parked anywhere within the Oceanwalk community. There are special events when they are allowed by permit. Do I have to pay the taxes? Yes, guests must pay the taxes required by Florida state and local tax. Will you hold my dates without the deposit? No, I tried that once and the person did not follow through to let me know they changed their mind. What floor is Oceanwalk Unit #5-306 located on? Oceanwalk Unit #5-306 is located on the 3rd floor in building #5. I’ve been to this condo a few times and let me just say it is flat out awesome! The screened in porch keeps out the bugs while you get to look out towards a beautiful estuary. The condo is very clean, offers WiFi, is well decorated, and is steps away from the pool and hot tub area. If you’re like me who loves to cook, you will find gas grills and tables so you can cook out and enjoy your meals while sitting under the shade at the pool area. At the rec building there are numerous items that you can sign out to use during the day, such as bocce balls and shuffle board equipment. Right across the street is the beach with an easy access point and few crowds. 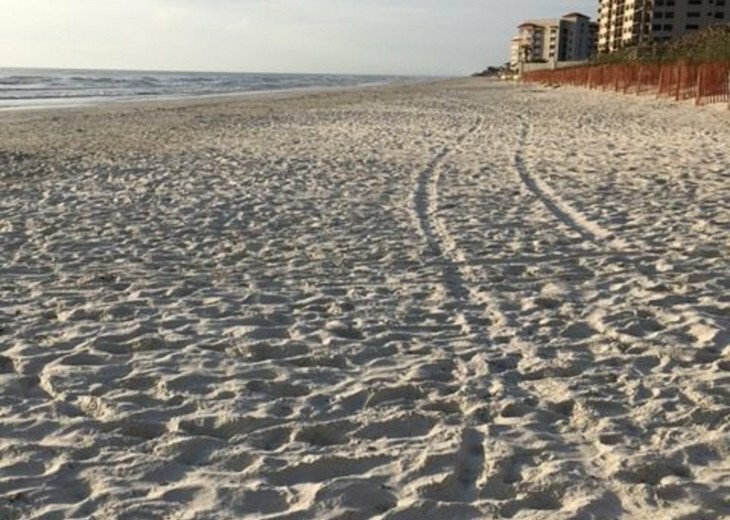 This partly unknown area of Florida is relatively unpopulated so you won’t have to fight for a spot on the beach. 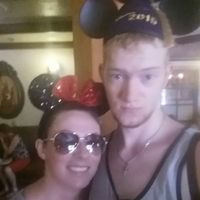 If you get tired of the beach scene and want to bring out the inner child in you, you can hop on over to Disney for a day which is only a couple hour drive away. The condo is also less than a two hour drive from Orlando Airport so you can depart the plane and be sitting by the pool with a cocktail in no time at all. Trust me, this place is a beauty and piece of gold in a location that will blow you away. Don’t hesitate and don’t just take my word for it, check it out for yourself!